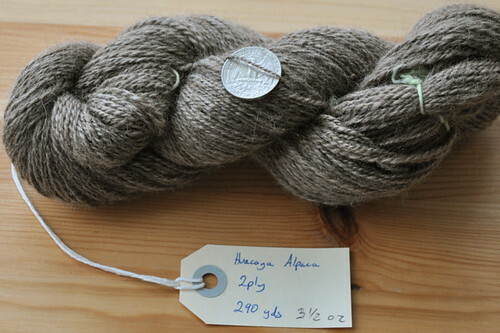 Finished my first alpaca skein in my favourite colour of undyed alpaca fleece. I have some leftover singles to demonstrate Andean plying with Laura. The singles snapped a lot during plying, I think I was afraid of putting too much twist in and left it too loose. Conventional wisdom says you put the same amount of twist in the plying as you put in the spinning. I think conventional wisdom is lying on this one, I way over-ply and let the finishing sort it out. It looks much better to me, the "balanced" yarns I’ve made look loose and horribly under-plied. Working on some deep red Falklands wool now, from Dunnose Head Farm, via Crafty Notions. The Falklands sheep are a merino cross and the wool is produced without herbicides, pesticides, dips, or foot-baths. It’s spinning crazy thin, so I’m going to try for a true 3 ply yarn. Lovely yarn! I think I’m just about ready to get to work on my alpaca, too.